At least four people died when a South African registered commuter omnibus side-swapped a haulage truck at Lundi Business Centre, nearly 110 kilometres south of Masvingo, along the Beitbridge-Harare Highway yesterday. Masvingo provincial police spokesperson Inspector Charity Mazula confirmed the accident, but said she was yet to get the finer details. A witness Mr Wellington Mudzimiri, said both the haulage truck and the kombi failed to negotiate well as they passed a curve. 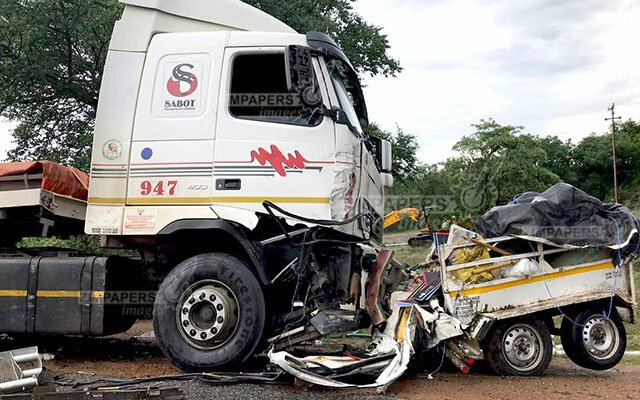 “The kombi was heading towards Masvingo and the truck was going to Beitbridge,” he said. “We just heard a loud bang and saw the kombi rolling several times before it landed on its wheels by the roadside. Another person who witnessed the accident, Mr Richard Chikomo, said they heard people shouting for help while lifeless bodies were scattered on the road.